Miller, S.A., Myers, M., Fahnestock, M.F., Bryce, J.G., Blichert-Toft, J. (2017) Magma dynamics of ancient Mt. Etna inferred from clinopyroxene isotopic and trace element systematics. Geochem. Persp. Let. 4, 47-52. NSF grant EAR-1057611 to JGB and SAM, the UNH Undergraduate Research Opportunities Program to MM, and the French Agence Nationale de la Recherche (grant ANR-10-BLANC-0603 M&Ms – Mantle Melting – Measurements, Models, Mechanisms) to JBT. Spilliaert, N., Allard, P., Métrich, N., Sobolev, A.V. (2006) Melt inclusion record of the conditions of ascent, degassing, and extrusion of volatile-rich alkali basalt during the powerful 2002 flank eruption of Mount Etna (Italy). Journal of Geophysical Research 111, B04203. Viccaro, M., Ferlito, C., Cortesogno, L., Cristofolini, R., Gaggero, L. (2006) Magma mixing during the 2001 event at Mount Etna (Italy): effects on the eruptive dynamics. Journal of Volcanology and Geothermal Research 149, 139–159. 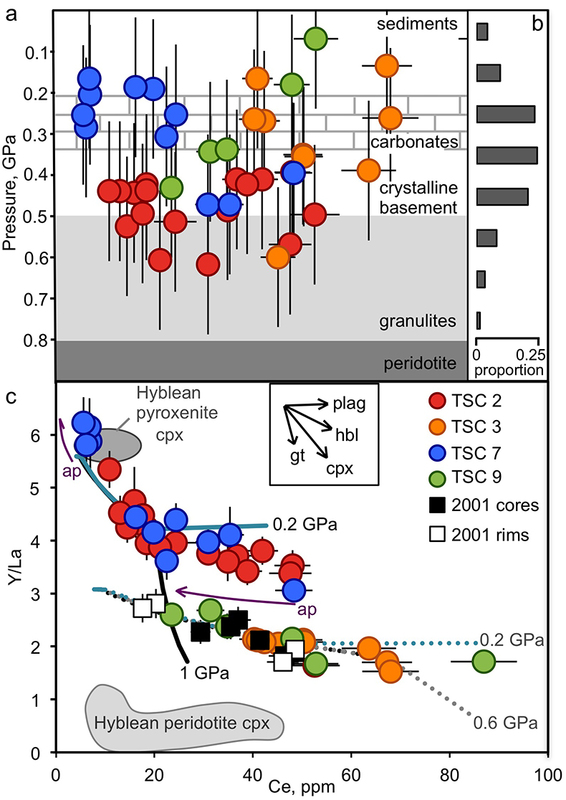 Correale, A., Martelli, M., Paonita, A., Rizzo, A., Brusca, L., Scribano, V. (2012) New evidence of mantle heterogeneity beneath the Hyblean Plateau (southeast Sicily, Italy) as inferred from noble gases and geochemistry of ultramafic xenoliths. Lithos 132–133, 70–81. Smith, P.M., Asimow, P.D. (2005) Adiabat_1ph: A new public front-end to the MELTS, pMELTS, and pHMELTS models. Geochemistry Geophysics Geosystems 6, Q02004. Prowatke, S., Klemme, S. (2006) Trace element partitioning between apatite and silicate melts. 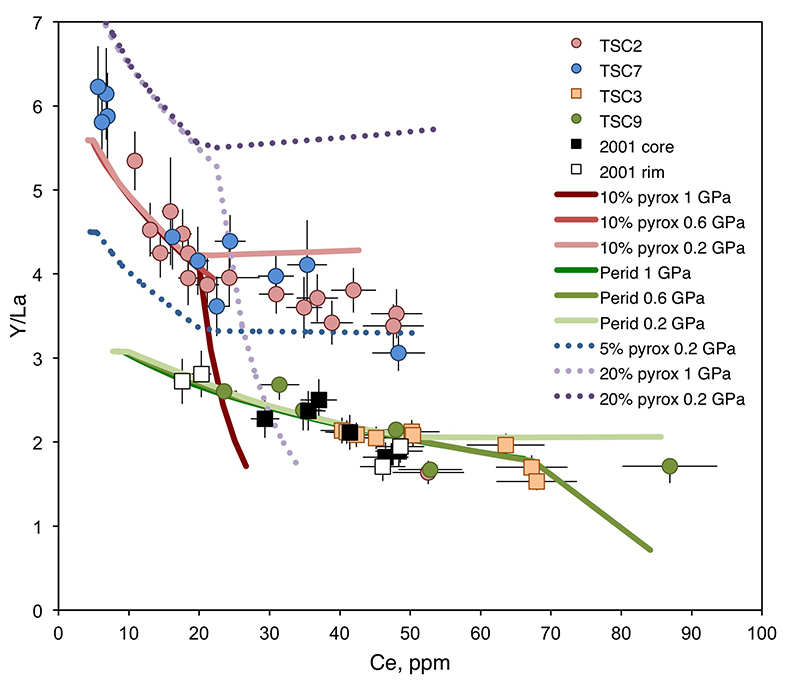 Geochimica et Cosmochimica Acta 70, 4513–4527.
. Ol+cpx±opx+sp is present at the start of both trends, though olivine drops out at T < ~1100 °C for pyroxenite melt. Lassiter, J.C., Blichert-Toft, J., Hauri, E.H., Barsczus, H.G. (2003) Isotope and trace element variations in lavas from Raivavae and Rapa, Cook‚ Austral islands: constraints on the nature of HIMU- and EM-mantle and the origin of mid-plate volcanism in French Polynesia. Chemical Geology 202, 115–138. Stracke, A., Bizimis, M., Salters, V.J.M. (2003) Recycling oceanic crust: Quantitative constraints. Geochemistry Geophysics Geosystems 4, 8003. Gaffney, A.M., Nelson, B.K., Blichert-Toft, J. (2004) Geochemical constraints on the role of oceanic lithosphere in intra-volcano heterogeneity at West Maui, Hawaii. Journal of Petrology 45, 1663–1687. Huang, S., Frey, F.A., Blichert-Toft, J., Fodor, R.V., Bauer, G.R., Xu, G. (2005) Enriched components in the Hawaiian plume: Evidence from Kahoolawe Volcano, Hawaii. Geochemistry Geophysics Geosystems 6, Q11006. Xu, G., Frey, F.A., Clague, D.A., Abouchami, W., Blichert-Toft, J., Cousens, B., Weisler, M. (2007) Geochemical characteristics of West Molokai shield-and postshield-stage lavas: Constraints on Hawaiian plume models. Geochemistry Geophysics Geosystems 8, Q08G21. Sims, K.W.W., Blichert-Toft, J., Kyle, P.R., Pichat, S., Gauthier, P.-J., Blusztajn, J., Kelly, P., Ball, L., Layne, G. (2008) A Sr, Nd, Hf, and Pb isotope perspective on the genesis and long-term evolution of alkaline magmas from Erebus volcano, Antarctica. Journal of Volcanology and Geothermal Research 177, 606–618. Blichert-Toft, J., Albarède, F. (2009) Mixing of isotopic heterogeneities in the Mauna Kea plume conduit. Earth and Planetary Science Letters 282, 190–200. Yamasaki, S., Kani, T., Hanan, B.B., Tagami, T. (2009) Isotopic geochemistry of Hualalai shield-stage tholeiitic basalts from submarine North Kona region, Hawaii. Journal of Volcanology and Geothermal Research 185, 223–230. Garcia, M.O., Swinnard, L., Weis, D., Greene, A.R., Tagami, T., Sano, H., Gandy, C.E. (2010) Petrology, geochemistry and geochronology of Kaua ‘i Lavas over 4· 5 Myr: Implications for the origin of rejuvenated volcanism and the evolution of the Hawaiian plume. Journal of Petrology 51, 1507–1540. Peate, D.W., Breddam, K., Baker, J.A., Kurz, M.D., Barker, A.K., Prestvik, T., Grassineau, N., Skovgaard, A.C. (2010) Compositional characteristics and spatial distribution of enriched Icelandic mantle components. Journal of Petrology 51, 1447–1475. Chekol, T.A., Kobayashi, K., Yokoyama, T., Sakaguchi, C., Nakamura, E. (2011) Timescales of magma differentiation from basalt to andesite beneath Hekla Volcano, Iceland: Constraints from U-series disequilibria in lavas from the last quarter-millennium flows. Geochimica et Cosmochimica Acta 75, 256–283. Salters, V.J.M., Mallick, S., Hart, S.R., Langmuir, C.E., Stracke, A. (2011) Domains of depleted mantle: New evidence from hafnium and neodymium isotopes. Geochemistry Geophysics Geosystems 12, Q08001. Viccaro, M., Nicotra, E., Millar, I.L., Cristofolini, R. (2011) The magma source at Mount Etna volcano: Perspectives from the Hf isotope composition of historic and recent lavas. Chemical Geology 281, 343–351. Zindler, A., Hart, S. (1986) Chemical geodynamics. 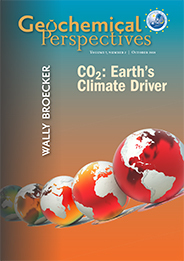 Annual Review of Earth and Planetary Sciences 14, 493–571. Salters, V.J.M., White, W.M. (1998) Hf isotope constraints on mantle evolution. Chemical Geology 145, 447–460. Workman, R.K., Hart, S.R., Jackson, M., Regelous, M., Farley, K.A., Blusztajn, J., Kurz, M., Staudigel, H. (2004) Recycled metasomatized lithosphere as the origin of the Enriched Mantle II (EM2) end-member: Evidence from the Samoan Volcanic Chain. Geochemistry Geophysics Geosystems 5, Q04008. Stracke, A., Hofmann, A.W., Hart, S.R. (2005) FOZO, HIMU, and the rest of the mantle zoo. Geochemistry Geophysics Geosystems 6, Q05007. Workman, R.K., Hart, S.R. (2005) Major and trace element composition of the depleted MORB mantle (DMM). Earth and Planetary Science Letters 231, 53–72. Conticelli, S., D'Antonio, M., Pinarelli, L., Civetta, L. (2002) Source contamination and mantle heterogeneity in the genesis of Italian potassic and ultrapotassic volcanic rocks: Sr‚ Nd‚ Pb isotope data from Roman Province and Southern Tuscany. Mineralogy and Petrology 74,189–222. Brems, D., Ganio, M., Latruwe, K., Balcaen, L., Carremans, M., Gimeno, D., Silvestri, A., Vanhaecke, F., Muchez, P., Degryse, P. (2013) Isotopes on the beach, part 2: neodymium isotopic analysis for the provenancing of Roman glass-making. Archaeometry 55, 449–464. Vervoort, J.D., Plank, T., Prytulak, J. (2011) The Hf-Nd isotopic composition of marine sediments. Geochimica et Cosmochimica Acta 75, 5903–5926. Viccaro, M., Cristofolini, R. (2008) Nature of mantle heterogeneity and its role in the short-term geochemical and volcanological evolution of Mt. Etna (Italy). Lithos 105, 272–288. Trua, T., Esperança, S., Mazzuoli, R. (1998) The evolution of the lithospheric mantle along the N. African Plate: geochemical and isotopic evidence from the tholeiitic and alkaline volcanic rocks of the Hyblean plateau, Italy. Contributions to Mineralogy and Petrology 131, 307–322.
. External reproducibility is conservatively set at 0.01 for 206Pb/204Pb and 0.02 for 208Pb/204Pb. Figure S-1 Location of Timpe Santa Caterina outcrop on base map from GeoMapApp (http://www.geomapapp.org; Ryan et al., 2009). Major geologic features from Rosenbaum and Lister (2004). Stratigraphy based on Corsaro et al. (2002) with section base at sea level (0 m). Dates (*) from Gillot et al. (1994). 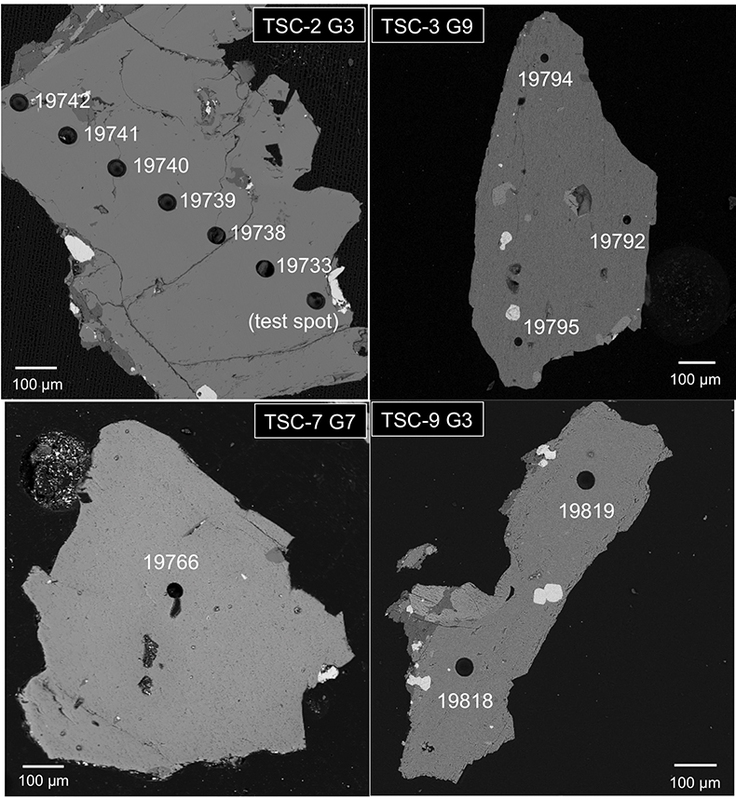 Figure S-2 Back scattered electron images of representative clinopyroxene grains from TSC lavas with laser ablation spots (Alfred University electron microprobe). Table S-1 Electron microprobe analyses of TSC* clinopyroxene LA-ICP-MS laser spots. All iron reported as FeO. Operating conditions used at the University of Oregon (UO) and Massachusetts Institute of Technology (MIT) facilities were 15 keV accelerating voltage and 10 nA beam current, with all analyses using a focused beam of ~1 microns and 30 s count times. Data were reduced using the CITZAF correction procedure of Armstrong (1995). The few totals lower than 98 wt. % have been omitted. MIT JEOL JXA-8200 electron microprobe uncertainties (1σ) are calculated from the standard deviation of replicate analyses of the DJ35 diopside-jadeite glass standard and several points inferred from back scattered electron imaging to be from the same clinopyroxene crystal growth zone. Analyses (wt. %) near laser spots TSC2_G1_3, TSC_G3_1, TSC2_G4_2, TSC7_G2_2, and TSC9_G5_2 totalled <98 wt. %. CaO abundances of the nearest same-grain spot were used to calibrate trace element concentrations (from TSC2_G1_2, TSC2_G3_2, TSC2_G4_1, TSC7_G2_1, and TSC9_G5_2, respectively). * TSC samples were collected from a cliff below Via Pianetto at 37°36’21” N and 15°10’20” E from the base at sea level to the top, approximately 85 m above, as shown in the cross section of Figure S-1. Table S-2 Trace element data (ppm) collected by LA-ICP-MS at the University of New Hampshire. Table S-3 Comparison of LA-ICP-MS repeat analyses of ML3B-G glass standard with reported literature values. * ML3B-G was analysed twice between every 5 unknown samples, totalling 24 standard analyses during collection of the TSC data reported in this study. 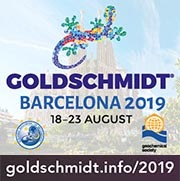 Analytical uncertainty is determined by having the first of each two ML3B-G analyses serve as the 'standard' for calculating the concentration of the second ML3B-G analysis, which is run as an unknown sample. The average value of the 12 ML3B-G 'unknowns' is compared here with the literature values for these trace elements (Jochum et al., 2006) along with the standard deviation of these ML3B-G runs. Table S-4 TSC clinopyroxene major element compositions (wt. %) along grain transects were analysed on the Massachusetts Institute of Technology (MIT) JEOL-JXA-8200 Superprobe. Uncertainty (2s) has been calculated from the standard deviation of replicate analyses of the DJ35 diopside-jadeite glass and ALP7 aluminous orthopyroxene standards, as well as several points inferred from back scattered electron imaging to be from the same clinopyroxene crystal growth zone: SiO2 (0.31), TiO2 (0.02), Al2O3 (0.07), FeO (0.08), MgO (0.11), MnO (0.01), CaO (0.30), Na2O (0.04), K (0.01), Cr2O3 (0.02). *Operating conditions of the MIT JXA-8200 consisted of a 15 keV accelerating voltage and 10 nA beam current, with all analyses using a focused beam of ~1 μm and 30 s count times. Data were reduced using the CITZAF correction procedure of Armstrong (1995). The few totals lower than 98 wt. % have been omitted. Table S-5 Hf-Nd-Pb isotopic data for Timpe Santa Caterina whole rock (WR) and clinopyroxene (cpx) separates*. The uncertainties reported for Nd and Hf isotope ratios are internal 2 s.e. We use the values of external reproducibility as reported in the footnote to identify analytically resolvable WR-cpx disequilibrium discernable above the 2σ level. * WR samples (italicised) are from Bryce et al. (2011) and are reported here for convenience. For the clinopyroxene samples, aliquots of 0.5 to 2 mm clinopyroxene handpicked from the TSC lavas were first leached in hot (~120° C) 6 N HCl to remove any Pb surface contamination following techniques outlined in Blichert-Toft and Albarède (2009). The resulting residues were subsequently digested in a mixture of concentrated HF-HNO3. Lead was separated prior to Hf and Nd separation using techniques described in Bryce and DePaolo (2004). Total Pb procedural blanks were <40 pg. Hafnium was separated from the Pb column eluent using the three column procedure described for high magnesium samples by Blichert-Toft (2001). Neodymium was from the Pb column eluent, separated from the residue of the first Hf column using a three column procedure starting with a small (0.5 mL) cation exchange resin (AG50x8) to strip off Fe and other major ions. The REE-rich elutions were subsequently passed through a 0.5 mL column filled with TRU-Spec resin to concentrate further the REEs, where the 2 M HNO3 was used to elute other ions and the REEs were collected with water. Nd was finally separated from Sm using a 1.6 mL LN-Spec column and a 0.25 M HCl elution. Total Nd procedural blanks were <30 pg and total Hf procedural blanks were <20 pg. † For the Nd isotopic measurements, instrument performance was monitored with a laboratory solution, and accuracy was assessed through repeated (n = 9) analyses of BCR-1 which yielded 0.512638 (with external 2σ = 0.000020). εNd was calculated using a CHUR value of 143Nd/144Nd = 0.512638. § Hf isotopic analyses were obtained following the techniques described in Blichert-Toft et al. (1997). The 100 ppb JMC 475 Hf standard, run throughout the analytical session (n = 21) to monitor instrument performance, yielded 176Hf/177Hf = 0.282160 (with external 2σ = 0.000015). εHf was calculated using a CHUR value of 176Hf/177Hf = 0.282772 (Blichert-Toft and Albarède, 1997). # Mass fractionation in Pb isotope analyses was corrected via Tl normalisation as described in White et al. (2000), and ratios were additionally adjusted for drift using the standard bracketing technique outlined in Albarède et al. (2004) using the NIST SRM values reported in Eisele et al. (2003). Four NIST SRM 981 samples, run as “blind” amongst the 17 bracketing standards analysed, yielded averages (with 2σ external precision) of 208Pb/204Pb = 36.7271 (0.0019), 207Pb/204Pb = 15.4978 (0.0009) and 206Pb/204Pb = 16.9408 (0.0012). Table S-6 Ranges of whole rock and clinopyroxene major and minor element compositions (wt. %) observed for the Timpe Santa Caterina flows studied. Figure S-3 Clinopyroxene trace element evolution during isobaric fractionation of peridotite melt (green) and 10 % pyroxenite component melts (red) at 1.0, 0.6, and 0.2 GPa. Modelling sensitivity to starting composition is illustrated by including paths for melts with 5 % and 20 % pyroxenite component shown as blue and purple dotted lines, respectively.